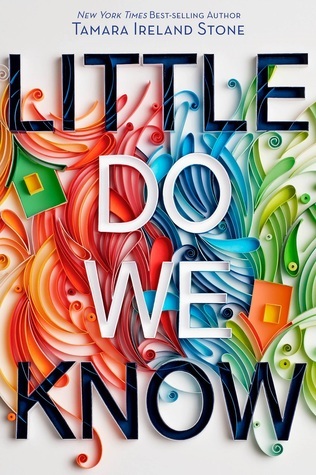 Little Do We Know by Tamara Ireland Stone has an expected publication date of June 5th, 2018 by Disney Hyperion and is a young adult novel. Next-door neighbors and ex-best friends Hannah and Emory haven’t spoken in months. Not since the fight—the one where they said things they couldn’t take back. Now, Emory is fine-tuning her UCLA performing arts application and trying to make the most of the months she has left with her boyfriend, Luke, before they head off to separate colleges. Meanwhile, Hannah’s strong faith is shaken when her family’s financial problems come to light, and she finds herself turning to unexpected places—and people—for answers to the difficult questions she’s suddenly facing.No matter how much Hannah and Emory desperately want to bridge the thirty-six steps between their bedroom windows, they can’t. Not anymore. About the author: TAMARA IRELAND STONE writes young adult and middle grade novels. Her New York Times bestseller, Every Last Word, won the Cybils Young Adult Fiction Award, the Georgia Peach Book Award, the Buxtehuder Bulle German Youth Literature Award, and was a YALSA Teens’ Top Ten pick. She is also the author of Time Between Us, which has been published in over twenty countries; its sequel, Time After Time; and Click’d, the first book in her new middle-grade series. Before she began writing fiction full time, Tamara spent twenty years in the technology industry. She co-founded a woman-owned marketing strategy firm where she worked with small startups as well as some of the world’s largest software companies. When she’s not writing, she enjoys skiing, seeing live music, watching movies, and spending time with her husband and two children. She lives in the San Francisco Bay Area. Visit her at TamaraIrelandStone.com.